Following the news in this column on May 8th that the price of Horizon's 24.99m Ellen Louise had been reduced by $100,000, I hear one of those rumours that prompts me to call Jim Wallace at Fraser Yachts in Fort Lauderdale who confirms that he finalised her sale on the morning of Friday, July 10th. Built by Horizon Yachts in 2005, Ellen Louise accommodates six guests and was asking $2.875 million. 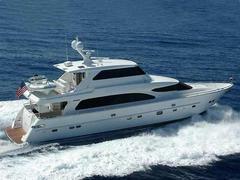 Jim tells me that Joe Majcherek of Gilman Yachts acted for the buyer in the transaction.